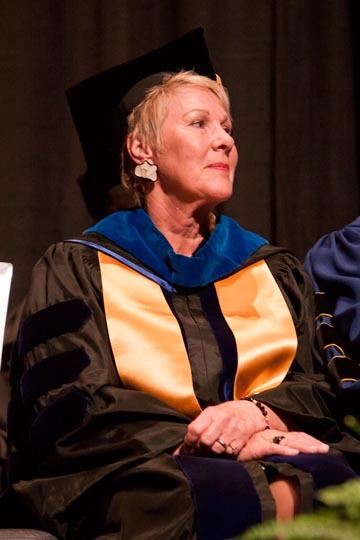 Edna V. Baehre-Kolovani on Friday donned the Tidewater Community College medallion and officially became TCC’s fifth president. The inauguration ceremony, attended by more than 500 guests and delegates from other higher education institutions, was held at the Virginia Beach Convention Center. Baehre-Kolovani’s investiture by Glenn DuBois, chancellor of Virginia’s community colleges, was preceded by an academic procession of TCC faculty and distinguished guests in colorful regalia – a tradition of presidential inaugurations. The event was open to all faculty, staff, students and alumni. Those unable to attend participated by watching a live webstream shown on all four TCC campuses. In her inauguration speech, Baehre-Kolovani laid out some of those challenges. Since coming into office on July 9, she has led the development of TCC’s five-year strategic plan, a collaborative enterprise to advance the college’s mission. In addition, Baehre-Kolovani is heading efforts to increase student services, develop new academic programs directly related to employment and increase student enrollment and success. “I challenge us all, collectively and individually, to choose our destiny and to achieve a common vision, a common purpose and a common focus so that TCC’s next 45 years will be even more remarkable,” she said. Stuart Steiner, president emeritus of Genesee Community College in New York and a mentor and former colleague to Baehre-Kolovani, spoke about those very qualities, which led him to hire her as Genesee’s dean of community services. A reception followed the formal proceedings. The vanilla cake with cherry frosting from Patti Cake of Moyock, N.C., was a tier of Baehre-Kolovani’s favorite books, which ranged from “Harry Potter and the Sorcerer’s Stone” to “Parzival” by Wolfram von Eschenbach. The TCC logo rested atop the layers. The inauguration and continuing 45th anniversary events are supported through the generosity of presenting sponsor TowneBank; supporters Barnes & Noble at Tidewater Community College, Noah Enterprises, Inc., Sentara Healthcare and STIHL, Inc.; and Pilot Media Companies; the cities of Chesapeake, Portsmouth, Norfolk and Virginia Beach; Davenport & Company LLC; Damuth Trane; DIA, Inc.; LifeNet Health; Caliper, Inc.; Checkered Flag Motor Car Company; Portsmouth Redevelopment and Housing Authority; and these individuals: Patricia P. Craven, Dixie Dean Dickinson, LaVonne P. Ellis, Beverly Boone Harris, Michael J. Lombardo Sr., James N. Roberts, Felice A. Saks, Susan Stinson, Stanley D. Waraska; Dr. and Mrs. Edward Weisburg, and Capt. and Mrs. W.C. Wheaton.